The Unlimited Motion Achilles Heel Gel Pad is a lightweight, comfortable, toeless sleeve that absorbs shock and vibration. It cushions, and protects against rubbing the Achilles area while releasing medical grade mineral oil to help soften and moisturize the skin. Can be worn with shoes, athletic footwear, ski boots, skates, and cleats. This product is washable and reusable. Click on images to view sizing chart. Soft conforming gel pad protects the posterior of the heel from pressure, impact, and friction. 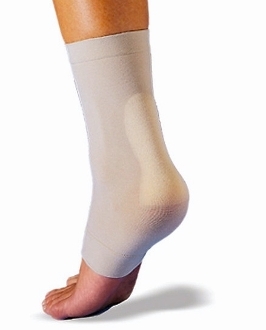 Provides gentle compression and dissipation of pressure around inflamed area. Effective in protecting against discomfort caused by ski boots, skates, cleats, other athletic footwear, shoes and boots. Reduces pain caused by footwear pressure on irregular heel bumps.